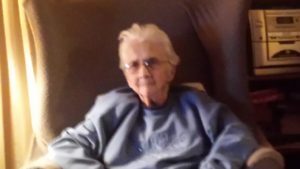 Florence B. Roy, 88, of Hermon, died on March 5, 2018, at her home surrounded by her loving family. There will be a graveside service on Friday, March 9, 2018 at 1 PM, at the Hermon Cemetery, Father Bryan Stitt officiating. Florence is survived by a son Edward “Buzzy” Roy of Hermon, daughters, Jane and her husband Francis Hewlett of Hermon, Vicki Luther and fiancé John Holly of Harrisville,a daughter in-law, Rita Roy of Hermon, numerous grandchildren, great and great great grandchildren, several nieces and nephews. She was predeceased by her son, Gregory Roy, a brother, Joseph Savage, sisters, Margaret Fowler, and Mary Savage. Florence was born on February 18, 1930, in Gouverneur, New York, the daughter of the late Joseph and Mary McDonald Savage. She graduated from Gouverneur High School in 1948, a marriage to Francis Roy ended in divorce. Florence owned and operated a boarding house under the direction of N.Y. State Dept. Of Mental Health from 1970 -1995, she also was the dining hall supervisor at St. Lawrence University. She enjoyed, cooking, baking and reading. In lieu of flowers contributions can be made to the Hermon Volunteer Rescue Squad. So sorry to hear about Grandma Flo. We are thinking of you all. Vickie and family. We will keep you in our hearts and in our prayers during this difficult time. So sorry for your loss. So sorry to hear of Flo’s passing. I have many fond memories of Flo especially back in the 1960’s. May God bless and comfort her family at this time. Heartfelt sympathy to u Buzzy, Jane and Vickie with the loss of your mother. U”s and your families r in my thoughts and prayers.